As you may know, traditional Tarot cards are an ancient spiritual system of cards that are often used by fortunetellers to satisfy the prolonged unfulfilled desires of the self or need to understand the past, or to predict the future. You pick a card randomly from the deck and the Tarot card philosophy explains the relevance of the chosen card in your life and provides some inspiration for the future. It’s all about past and future @traditional Tarot cards which is more or less a speculation. But the need of hour is not to speculate but participate. Participation is exactly what the Osho Zen Tarot is all about. 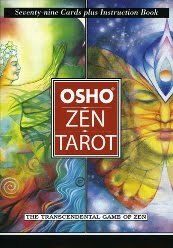 This Osho Zen Tarot focuses on gaining an understanding of the present, now-here and not on the dead past or speculation of unborn future. As philosophy is speculation and Zen is participation, where can the participation be? You can neither relive the past nor participate in the future. All you have in your hands to participate is the present, here and now. That’s Osho Zen Tarot all about, it is a system based on the wisdom of Zen helping to find a new clarity of understanding in our innermost hearts. Osho deck of Zen Tarot cards are a wonderful source of inspiration and now with this newly launched HD iPad App, you can read them on the go, anywhere anytime; and even pick your own cards. The accompanying text comes from Osho’s talks on Zen, and helps the reader to enjoy the present and just take a look and see things as they are. OSHO's teachings are amazing and this is the first time I've seen the tarot deck! The illustrations are amazing and I'll need to find a deck of my own to add to my ever-growing collection. The ipad app makes it even easier to use, so I'll be sure to give it a whirl.